Linux Fedora Core 4 step-by-step installation screnshot the preparation of the installation process. Linux Fedora Core 4 step-by-step installation screnshot, the preparation of the installation process. Fedora Core is complete desktop and server operating system. Fedora Core is base on open source software so it's completely free operating system, you can download and used the fedora core as an desktop or server operating system with no cost charge to your pockets. You also can find Fedora Core on store near you and they charge you with the cost of the installation media and may be some documentation, but no charge for the license. 4. 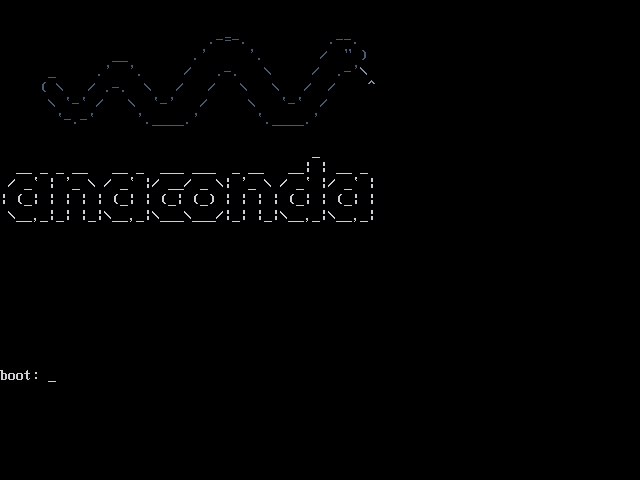 Free desktop tools and you can use fedora Core as an server. 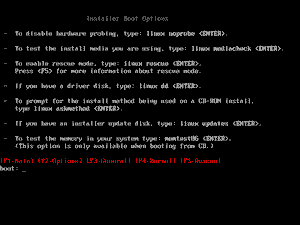 Set the computer, boot sequence to boot the Linux Fedora Core installation media from CD-Rom drive. 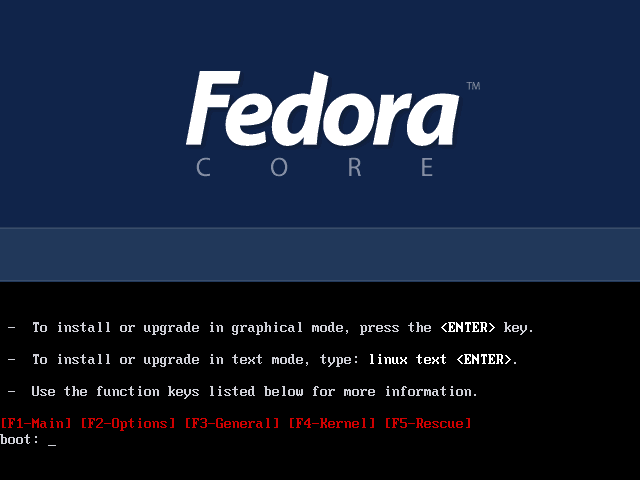 Testing the Fedora Core 4 installations media using Linux Mediacheck. Fedora Core 4 Installation Process (Start install Fedora Core 4 to Hard Disk). 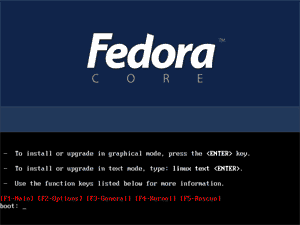 GNU/Linux Fedora Core: Login in. 1. Download the Fedora Core 4 ISO CDs/DVD image from Fedora Core official site at http://fedora.redhat.com . 3. Burn the downloaded image to CDs or DVD. 1. Then insert the Fedora Core 4 installation CD-ROM number 1 into the CD-ROM drive, then restart your computer and make sure that your computer is booting from the CD-ROM drive. 3. 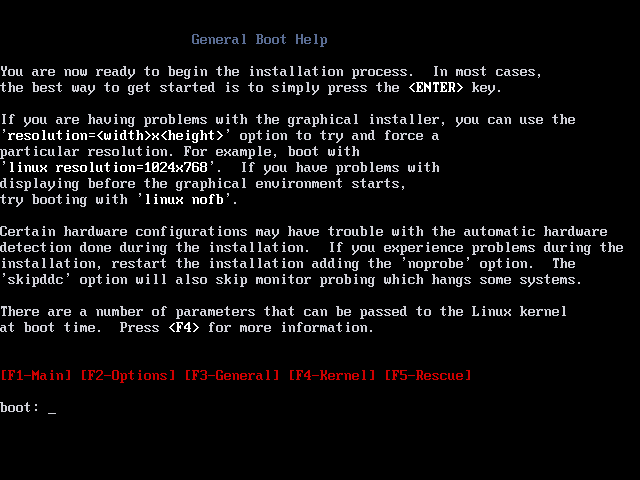 To view other boot options, use the [F1], [F2], [F3], [F4], [F5] and [F7] key on the boot screen. 4. Press <Enter> key on the Main screen [F1-Main] to install Fedora Core 4 using the graphical mode installer, or type in 'linux mediacheck' on the boot option to start checking the installation media. Fedora Core 4 main boot screen [ F1-Main ]. -- To install or upgrade in graphical mode, press the <ENTER> key. -- To install or upgrade in text mode, type: linux text <ENTER>. -- Use the function keys listed below for more information. 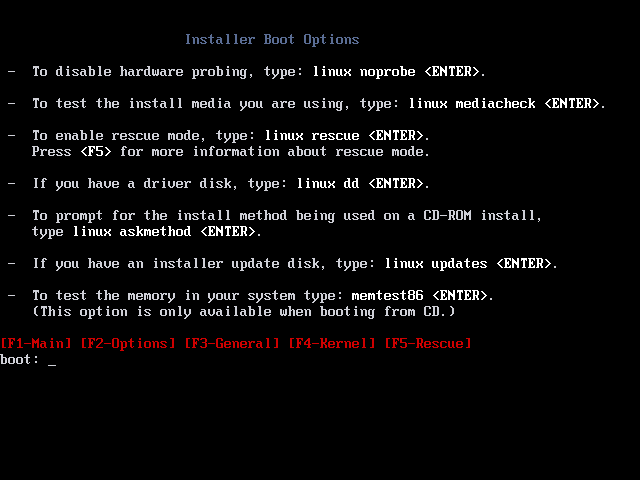 Fedora Core 4 Installer Boot Options [ F2-Options ]. -- To disable hardware probing, type: linux noprobe <ENTER>. -- To test the install media you are using, type: linux mediacheck <ENTER>. 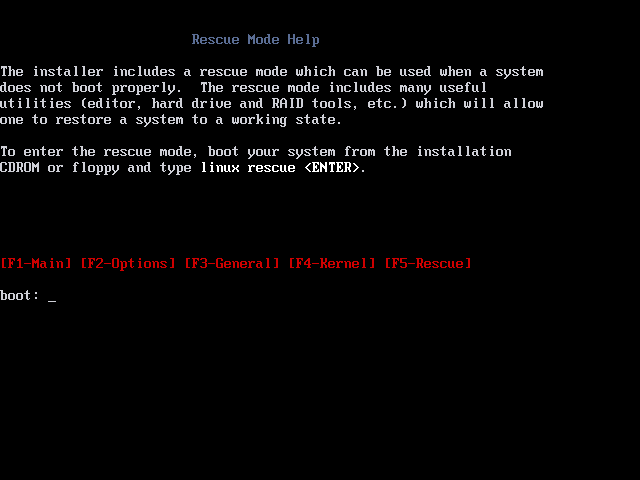 -- To enable rescue mode, type: linux rescue <ENTER>. -- If you have a driver disk, type: linux dd <ENTER>. -- If you have an installer update disk, type: linux updates <ENTER>. -- To test the memory in your system type: memtest86 <ENTER>. Fedora Core 4 General Boot Help [ F3-General ]. the best way to get started is to simply press the <ENTER> key. 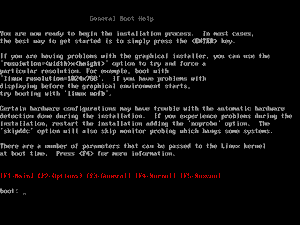 try booting with 'linux nofb'. 'skipddc' option will also skip the monitor probing which hang some systems. at boot time. Press <F4> for more information. 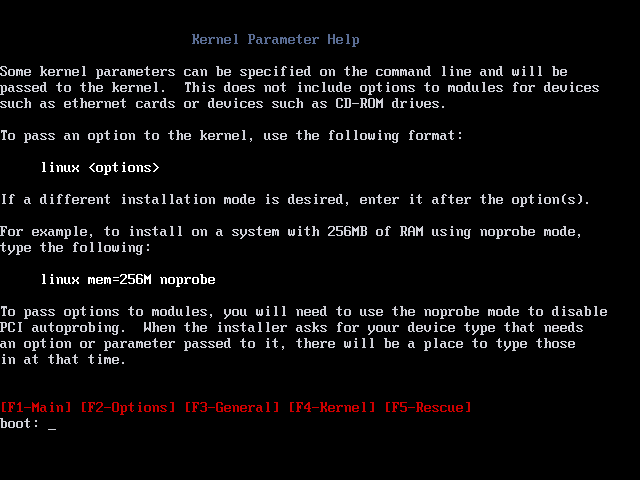 Fedora Core 4 Kernel Parameter Help [ F4-Kernel ]. such as ethernet cards or devices such as CD-ROM drives. 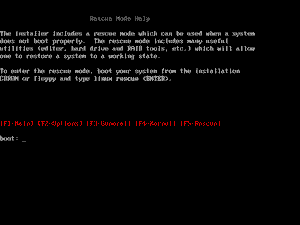 Fedora Core 4 Rescue Mode Help [ F5-Rescue ]. one to restore a system to a working state. CDROM or floppy and type linux rescue <ENTER>. 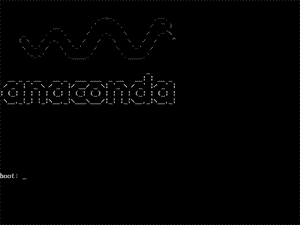 Fedora Core 4 Anaconda boot screen [ F7-Anaconda ]. All Fedora Core 4 installation screenshot publish here are for educational purpose only. Suggestions and comments from you to improve this page or may be on the Fedora Core 4 installation screenshot are welcome. NEXT: Testing the Fedora Core 4 installations media using Linux Mediacheck. Keywords: install linux, install fedora linux, install fedora core 4, fedora core 4 installation, fedora core step-by-step installation, installation process, Fedora Core 4 screnshot, install fedora core.